Thanks for the tips to Tim Tyler – see his comment on cultural evolution keeps on coming in books as well as articles. I know Maria Kronfeldner and know she is not a fan, but hey, I am not into censorship. The list was ‘about’, not necessarily ‘for’. In my view Ridley’s The Rational Optimist is only marginally about Darwinian-style sociocultural evolution in the scientific sense. It is an argument that human history is a story of progress brought about by the increasing scale of cooperation, specifically trade. Around the turn of the century, I used to give Robert Wright’s somewhat similar book Nonzero: The Logic of Human Destiny to students to read as a contrast to the pessimists such as Huntington’s Clash of Civilizations or Kaplan’s The Coming Anarchy. I once wrote a long article which I never published on the application of sociocultural evolutionary theory to marketing. If and when I get back to the topic I will read Scaglia although if I understand the publisher, Project Webster, their books are “curated from Wikipedia” which does not inspire great confidence. And finally, thanks for the tip to your book which looks like it is more up my alley and which I will definitely obtain and read. Cultural evolution keeps on coming, in books as well as articles. Kate Distin. 2011. Cultural Evolution. Cambridge University Press. Robert H. Frank. 2011. The Darwin Economy: Liberty, Competition, and the Common Good. Princeton University Press. Maria Kronfeldner. 2011. Darwinian Creativity and Memetics. Acumen Publishing Ltd.
Alex Mesoudi. 2011. 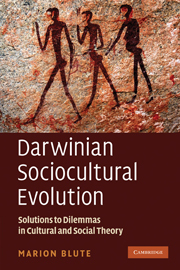 Cultural Evolution: How Darwinian Theory Can Explain Human Culture & Synthesize the Social Sciences. University of Chicago Press. I haven’t read all four of these yet, but will be and am looking forward to it!